paroxysmal atrial flutter. She was admitted to Cardiology department because of repeated pre-syncope. She was on carvidilol, quinapril, spironolactone, bumetanide, atorvastatin and digoxin therapy. Her ECG on admission is seen above. This is a junctional escape rhythm in the setting of digitalis intoxication. Sinus bradycardia, sinus arrest and sinus Wenckebach conduction are not uncommon in digitalis toxicity. 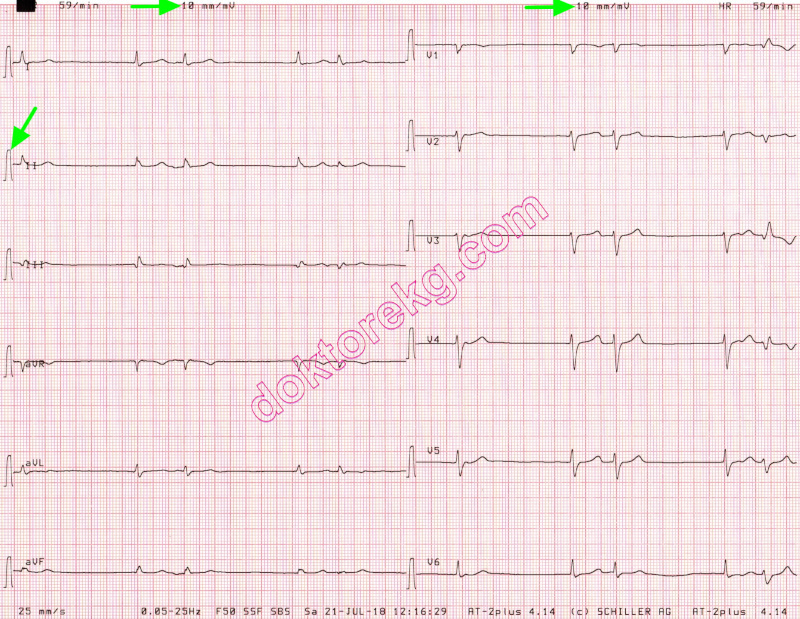 atrioventricular (AV) conduction, it has also been shown that digitalis slows/blocks the retrograde fast pathway conduction. in a retrograde fashion via the slow pathway and then antegradely down to the ventricle via the fast pathway. 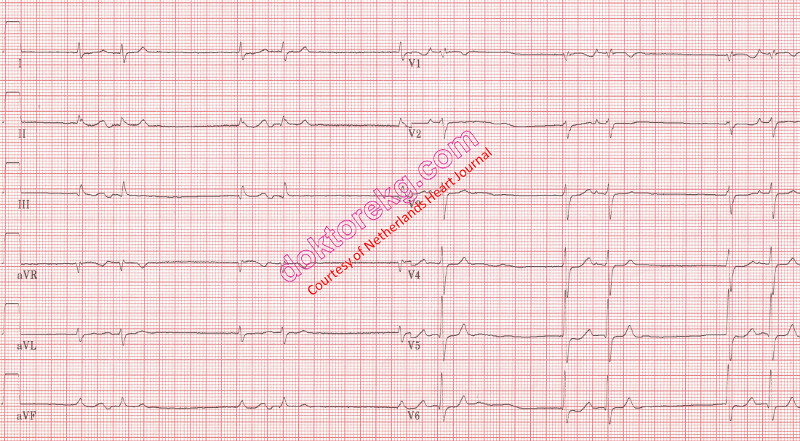 The ECG above has been used with the permission of Netherlands Heart Journal. Click here to read the relevant article by Alzand B.S.N. Figure 8. Above is the ladder diagram explanining the mechanism of the group beating in ECG 8.
and then antegradely to the ventricle (echo beat) via the fast pathway. ECG 9a. The ECG above belongs to a 60 years-old man with acute anterior myocardial infarction. It was recorded 60 minutes before coronary angiography. The rhythm is sinus. ECG 9c. Ten seconds after the ECG 9b, his rhythm was sinus (left side of the above tracing). The recording was then stopped. Two minutes later, the recording was started again when accelerated junctional rhythm emerged. Now the QRS complexes lack preceding P waves. Instead, the retrograde negative P waves are seen in the ST segment. 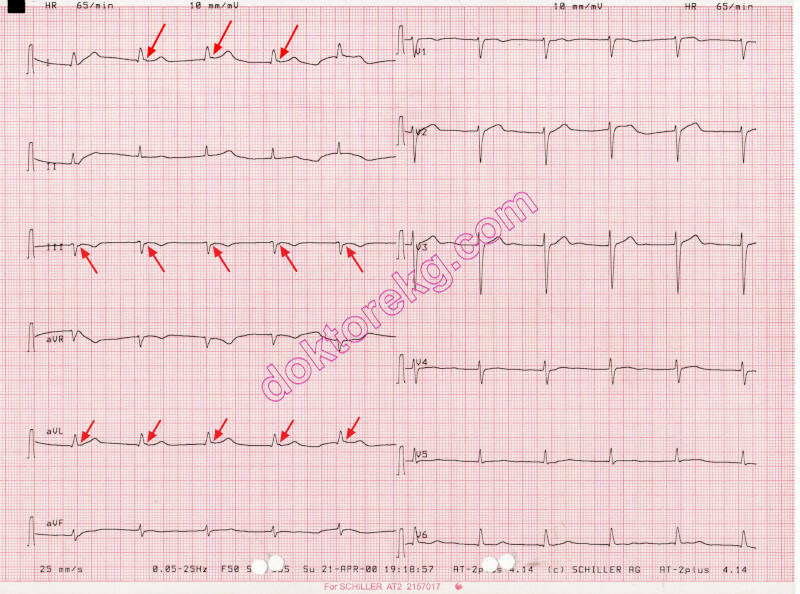 This rhythm also subsided quickly and sinus rhythm appeared again. ECG 10a. 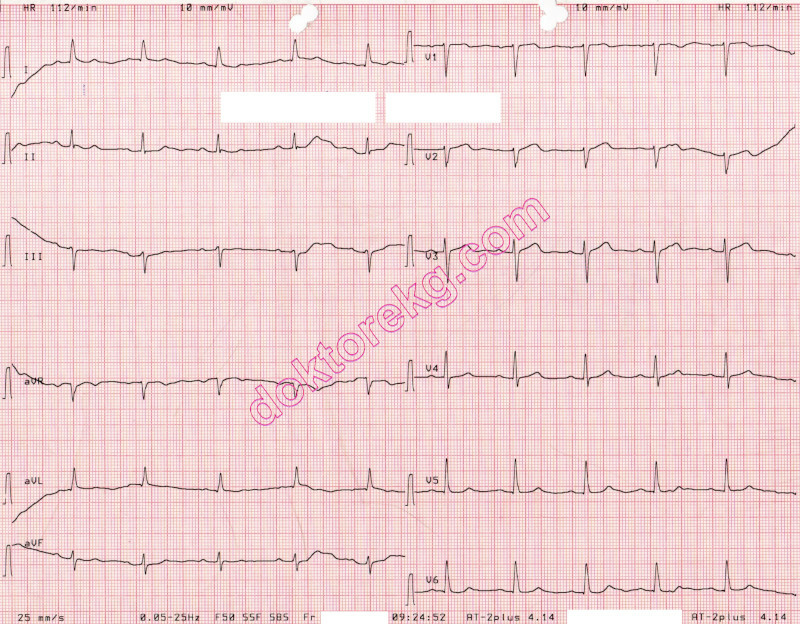 The above ECG is from a 78 years-old man with coronary artery disease. It was recorded immediately before triple coronary bypass surgery + mitral ring annuloplasty. Dr. Sinan Altan Kocaman has donated the above ECG to our website. ECG 10b. The above ECG is belongs to the same patient. It was recorded 5 days after the cardiac operation. The patient was under positive inotrope therapy during this time. ECG 10c. There are no P waves preceding the QRS complexes. 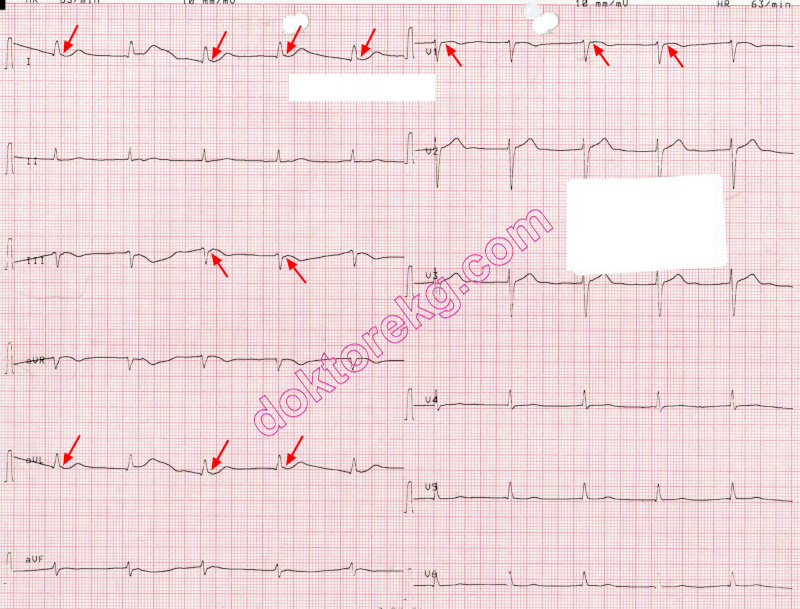 Small deflections (waves) following the QRS complexes are difficult to notice at first glance. . Sometimes P waves may follow QRS complexes during nodal rhythm (as is above). The patient was under positive inotrope therapy when this ECG was being recorded. The diagnosis is nodal rhythm. ECG 10d. The above ECG was also recorded on 5th postoperative day. P waves following QRS complexes are difficult to notice at first glance. ECG 10e. 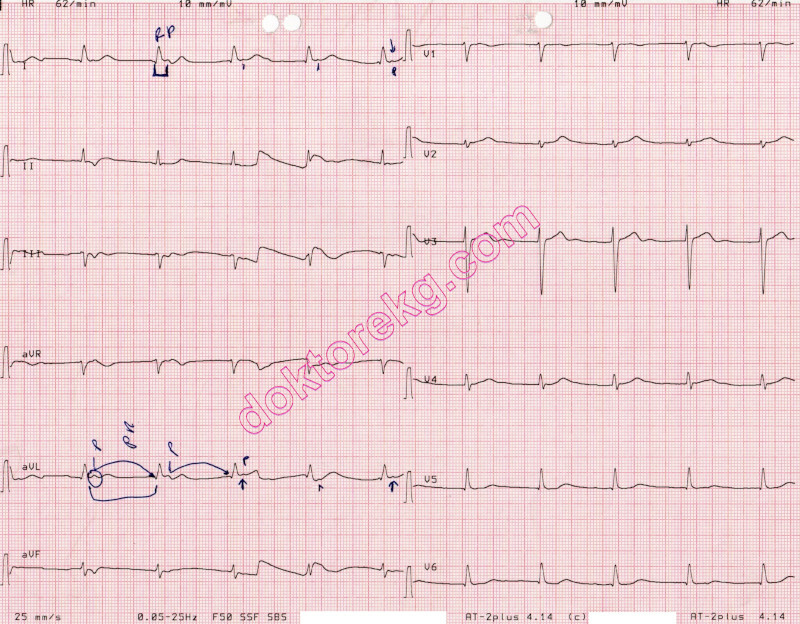 The above ECG was recorded after cessation of positive inotrope therapy. P waves following QRS complexes are more clear now. and coronary artery disease. This ECG is recorded at a standard calibration of 10 mm/mV. ECG 11b. This ECG belongs to the same woman. It was recorded 30 seconds after the ECG 11a, but at a calibration of 20 mm/mV. Now P waves are easily discernible. The rhythm is junctional (nodal) rhythm. Junctional beats do not have preceding P waves. 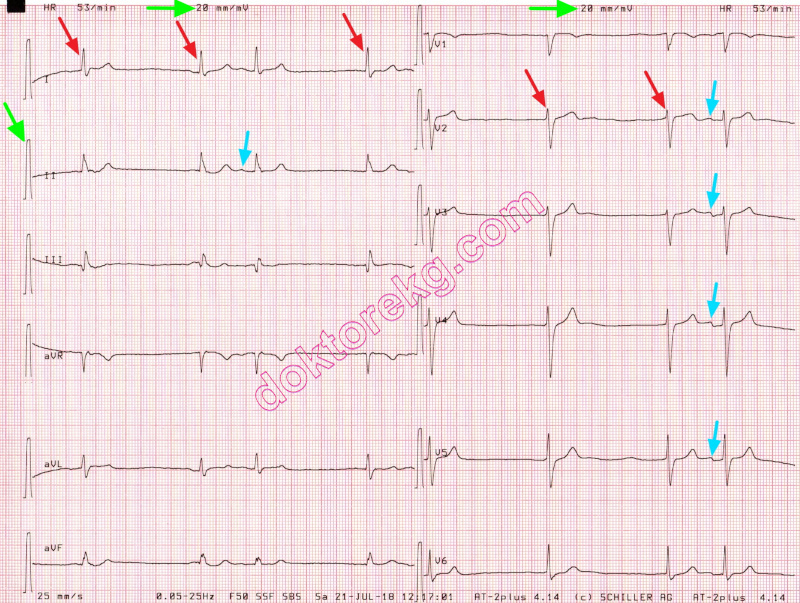 Some atrial extrasystoles with P waves are also seen.